Pura Singapadu: Beauty in Details | What an Amazing World! We only had 3 hours left before we had to be at the airport in Bali to catch the flight back to Jakarta. 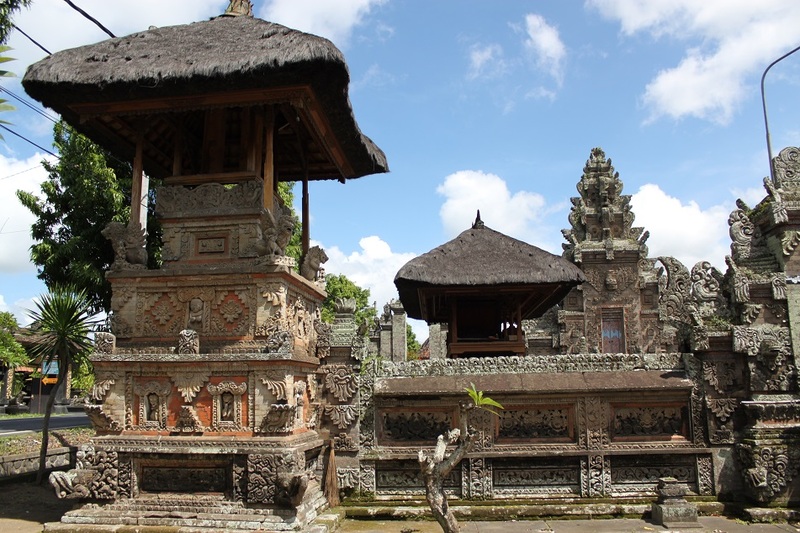 But after watching the Barong performance at Batubulan and having visited some of eastern Bali’s most picturesque palaces, gardens and temples we ran out of idea. “Where else do you want to go?” our driver, Bli Komang, asked us while driving his car southward to the airport. “What’s close from here?” I asked him back, since I could only think of places too far from where we were. “I know a place you will like,” he replied confidently. He then drove his car through small streets around Batubulan – jalan tikus or rat’s track as Indonesians call such network of twisted narrow streets for avoiding traffic congestion on major roads. Bli Komang has been working as a driver for years and the Barong performance at Batubulan is one of the most prominent sites for culture-oriented tourists who wish to watch authentic, albeit having been modified to suit a greater audience, Balinese traditional dances. A place he is very familiar with. Minutes after navigating through Batubulan’s jalan tikus he finally arrived at a quiet intersection, with only a handful of cars passing by, then parked his car at an open space near a compound which seemed to be a small pura (Balinese Hindu temple). As we stepped out of the car it became obvious that it was unlike any pura we had visited before. 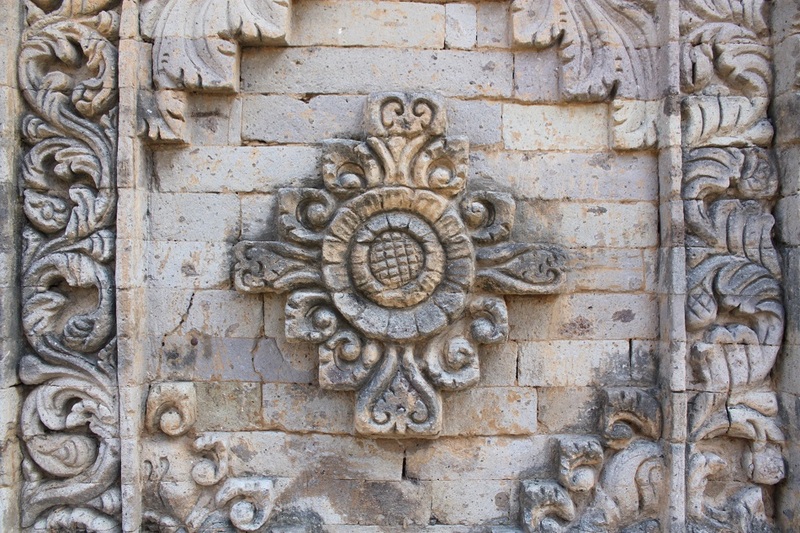 Two rows of meticulously carved stone panels adorned the outer wall of the pura compound, each richly engraved with symmetrical and intricate floral patterns. 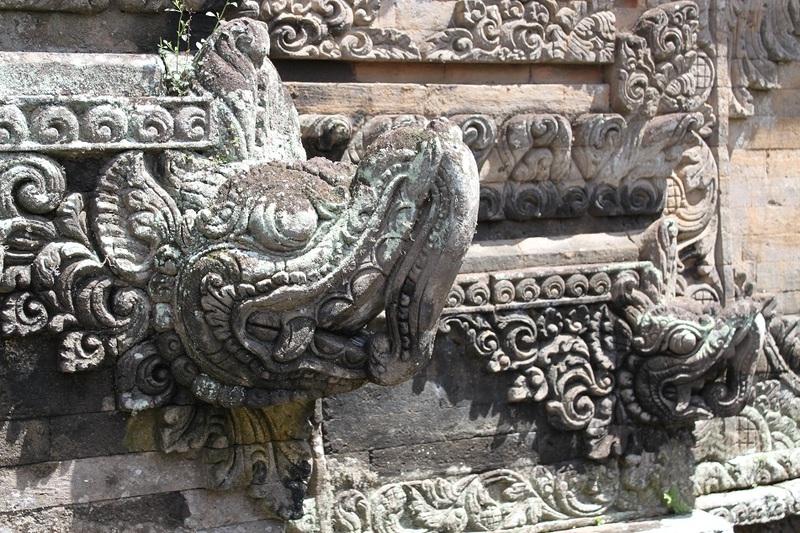 Near the candi bentar – the split gate – figurines of a mystical fanged elephant embellished the corners, greeting us with a petrified grimace. 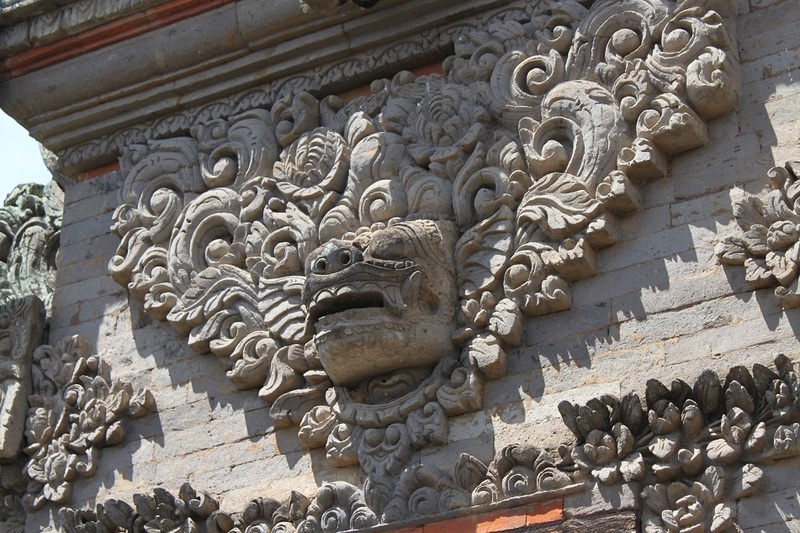 The village of Batubulan not only is known for its Barong dance, but also for its stone carving industry. In the meantime the neighboring village where Bli Komang took us, Singapadu, seemed to have a fair share of its own excellent carvers. 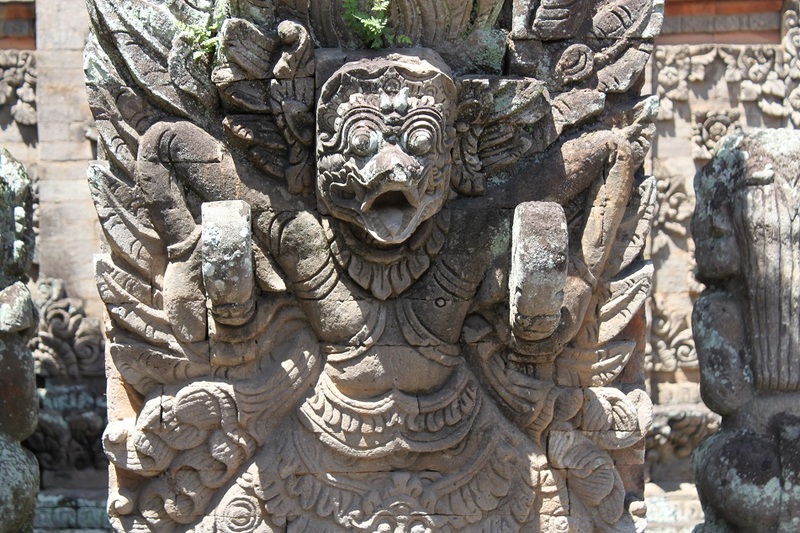 Earlier that day he explained to us that schoolchildren in Bali had to choose from four kinds of traditional arts to learn about: painting, dance, decorative sculpture, and carving statues. Hence the rich and lively artistic landscapes on the island, creating unrivaled cultural sights among the Indonesian sprawling archipelago. 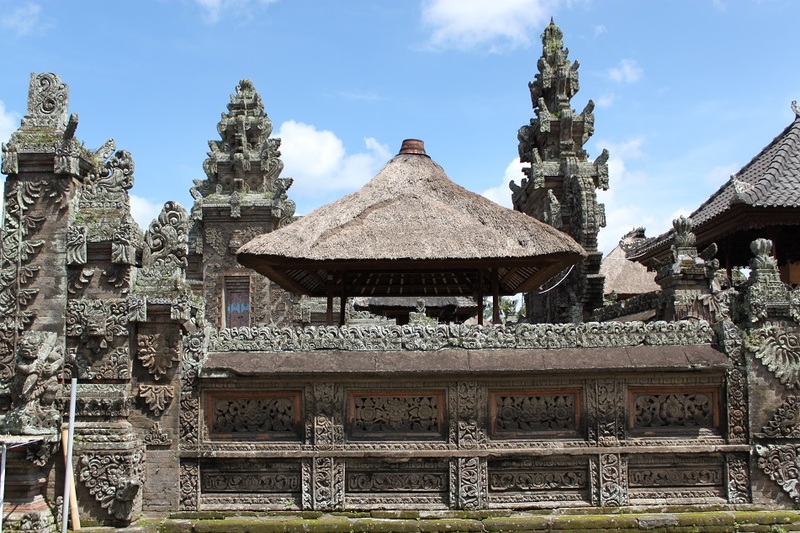 As soon as we entered the courtyard it was apparent that the pura was not known to tourists. No ticket booth, no guard, not even a single donation box was spotted. However the silence was soon broken by the sound of our camera shutters as we started taking hundreds of images of the beautifully embellished pura. Bli Komang, meanwhile, walked to a corner of the temple grounds and approached an old man who was sweeping the inner courtyard. A few minutes later he came back to us. “He’s my uncle,” Bli Komang said with a big grin. Then he elaborated on the temple itself. “You see those detailed carvings? You can’t find them in newer temples because the cost to make one is too expensive now.” His words was a nod to my previous observations on some of the island’s newer temples which were missing the detailed floral patterns on their walls and candi bentar, although still retaining the iconic Balinese temple outlines, hence their identity. 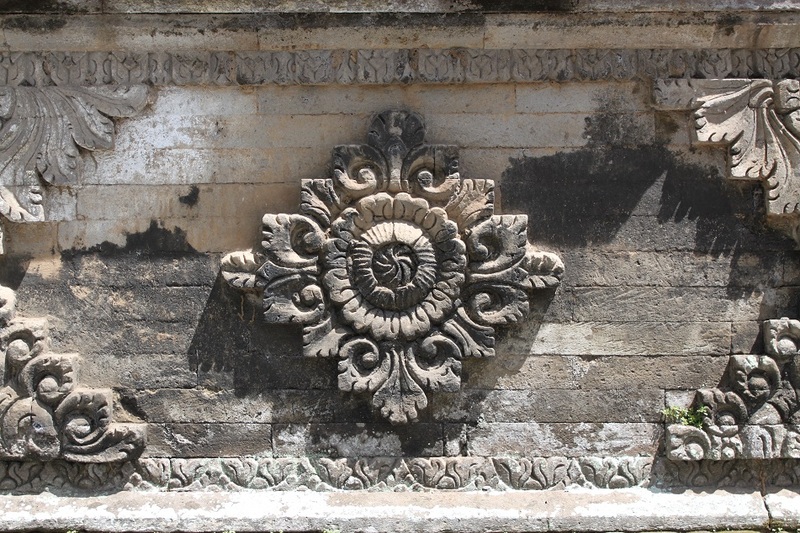 Bli Komang himself used to work as a sculptor before he decided to become a driver, thanks to Bali’s thriving tourism industry and the lack of decent public transport on the island which create strong demand for the job to shuttle visitors from one place to another. But he is not the only one who left their old job as a sculptor as he was just following the trend – where the money went. 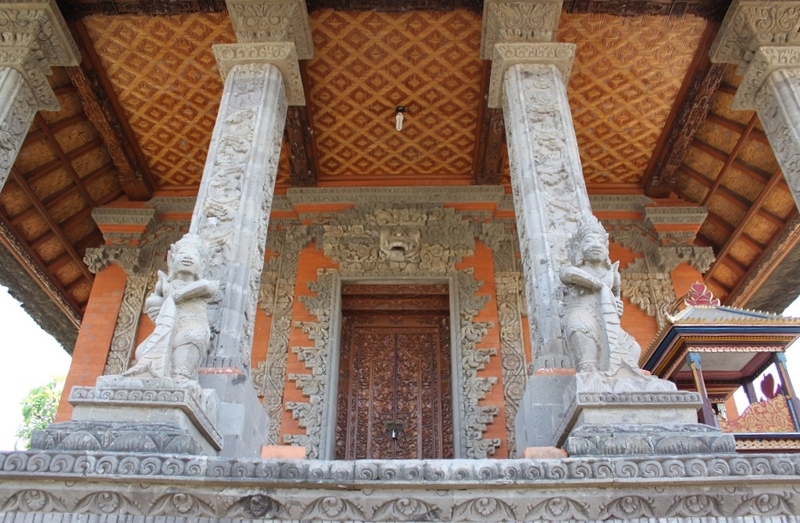 That alone has contributed to the steep increase of cost to build a pura with richly intricate stone carvings, on top of the country’s annual inflation rate, leaving Pura Singapadu as one of the last Balinese Hindu temples built in such a unique architecture style with decorations newer temples can only envy. I would say so, Gara. 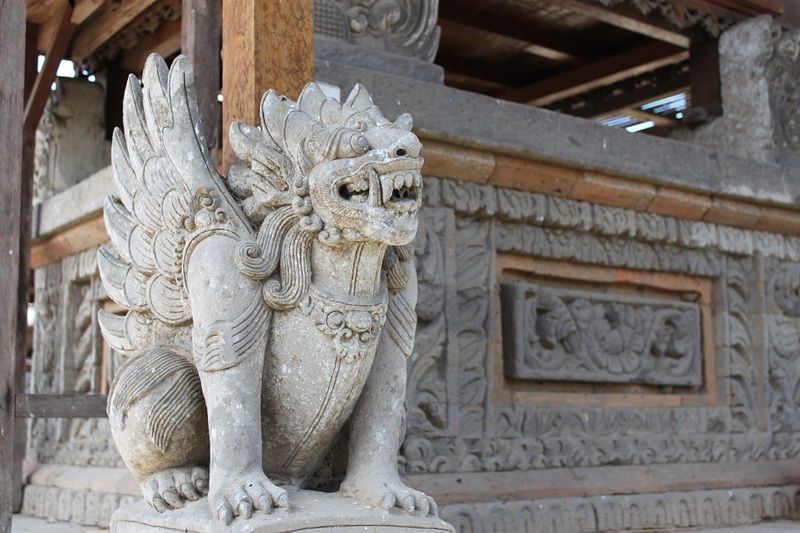 From the traditional paintings and dances of Ubud, to the stone and wood carvings of Batubulan, Gianyar is the island’s cultural hub. Wow! SO beautiful! Great photos of your discovery. Thanks, Kelly. You can’t find this temple in any guide book or online travel resources, as far as I know. Nice photos Bama. 🙂 What a good piece of luck the driver knew of such a place! Thank you, Lee. I wasn’t expecting that either and was rather preparing myself for a long wait at the airport before my flight departed. When you say locals you mean those who don’t live or work around tourist hotspots, right? I remember when I was in Istanbul I asked a local vendor which hamam he recommended to visit. It turned out he suggested us to go to one of the city’s most famous hamams. Not quite what I expected from ‘asking the locals’. Anyway, I was more than ecstatic when my driver in Bali took me to this small temple. It’s easily one of my favorite temples on the island now. Thanks, Deb! Stunning pictures and beautifully narrated! Thank you for your lovely comment, Deboshree! There is nothing quite like a local taking you to a place special (out of the ordinary) to make a trip something special. Beautiful photos and it again just leads me to marvel at the creativity and talent of these places so far back in history ~ simply awe inspiring. What is perhaps even more amazing is the fact that places like these are not on any tour itinerary…hidden gems, and thankful that you uncovered this one for us! Had my driver not been so observant — or I not been too obviously obsessed with any carvings — I would have had missed this small temple completely. Sometimes asking the locals can bring you to such special places, but it also involves a little bit of luck based on my experience. Thank you for your thought and comment, Randall! Thanks! I’m glad you enjoyed this post as much as I enjoyed sorting out the photos. 🙂 Happy travels! I’ve been living in Indonesia for a bit longer than a year and it’s amazing how many outstanding & non-visited places you can discover getting lost, letting it flow or talking to local people. 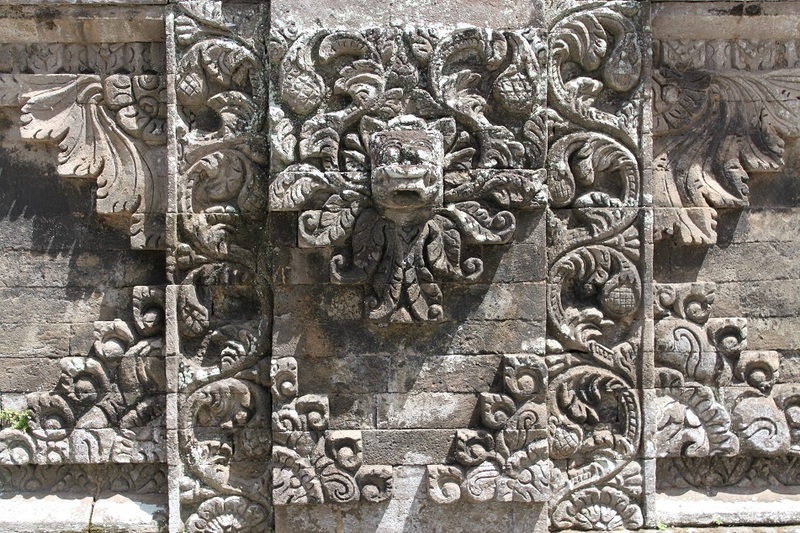 As a culture lover, Indonesia is the place to be and simply enjoy every single detail of this gorgeous country. Congratulations for your blog Bena! I couldn’t agree more with you. Three years ago I met a fellow travel blogger from Hong Kong. Since then he’s become my perennial travel partner and his love to Indonesia only grows bigger every time he visits the country. He’s an Indonesia addict, I must say. 🙂 Gracias! Bama obviously you have found as we have often that drivers have some of the best informarion! Wonderful captures. Dibantu juga sama saya yang setiap kali ambil foto pura atau ukiran yang mendetil selalu keliatan heboh. Pernah beberapa temen saya bilang kalo saya pas lagi foto-foto posisi saya bisa lebih heboh dari objek foto itu sendiri. Nah mungkin karena itulah Bli Komang ngeh dan tau kalo saya suka sama pura dan ukiran/relief. Dibawalah saya ke pura kecil ini. 🙂 Kacamata pariwisata Indonesia sudah selayaknya mulai diarahkan ke warisan budaya juga. Those are some of the most ornate temple decorations i have ever seen, anywhere!! And beautifully captured Bama. Just fabulous! 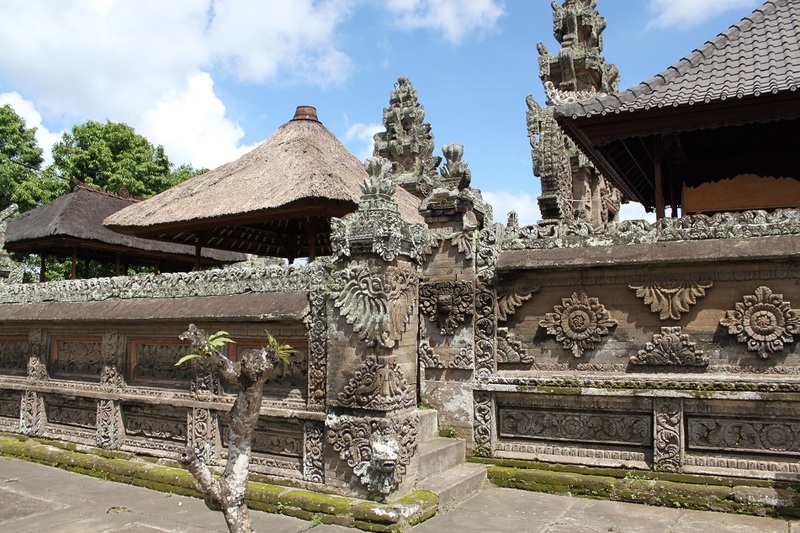 This temple is more intricately decorated than most of Bali’s more famous temples. That and the absence of any major tourist attractions near the temple made my visit very special and memorable. 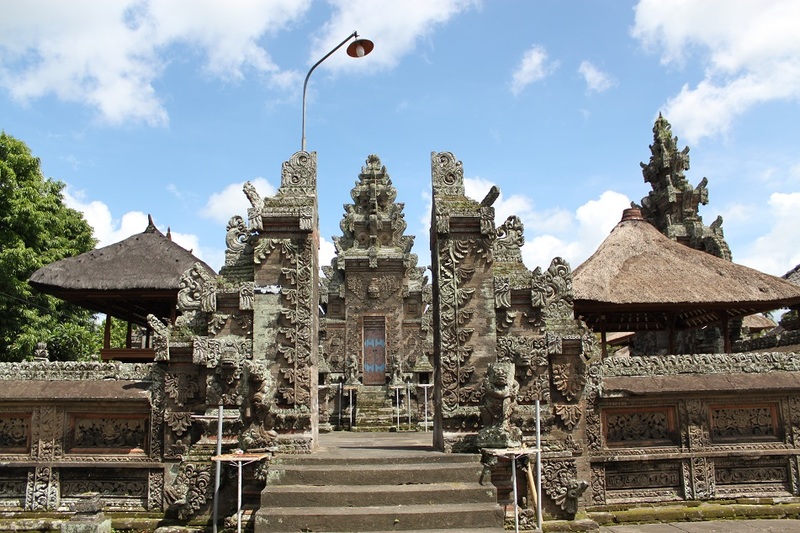 When you come to Bali I will have to ask Bli Komang for the directions to get to this temple because I know you would love it as much as I do. 🙂 Thank you, Madhu. It’s always a pleasure to share things that amaze me with others. Thanks for reading! It surely is. This temple also reminds me of some ornately decorated temples in India I have been dreaming to visit. You must visit temples in India. They show awesome combination of art, architecture and beauty. 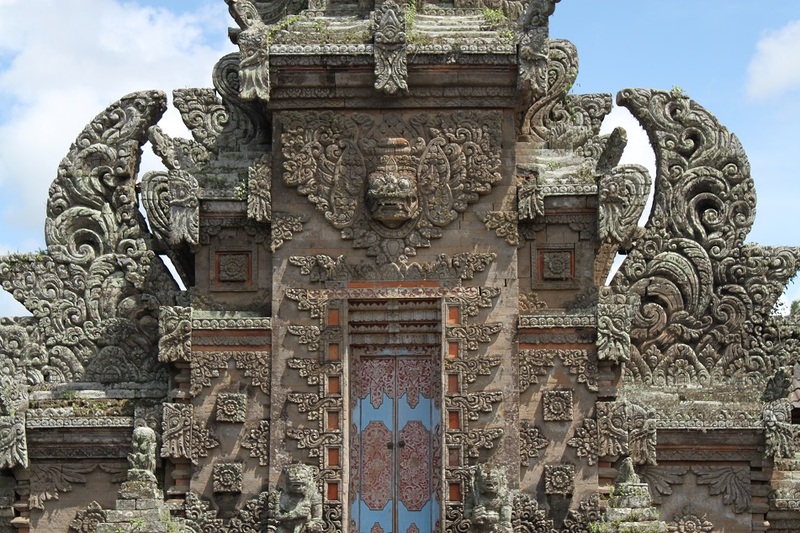 I love Indonesian ancient temples and it was the Indian traders and priests who introduced Indian architecture to Indonesia centuries ago. So it’s natural for me to visit Indian temples when I’m in the country. Every square inch is art. Wow! We certainly didn’t see anything that impressive on Bali! That is interesting that kids have to study one of four arts. The art, dance, culture all make Bali so special. Geographically, it was the least interesting and least beautiful island we went to in Indonesia (heresy, right?) but the culture is so unique that is was a special place to visit. When I was in Lombok with James, at a beach called Selong Belanak, I told him that the beaches in southern part of the island were far more beautiful and majestic than any beaches I had visited in Bali. But it’s the culture and traditions which keep me coming back to Bali, including a recent four-day trip to the remote northwestern corner of the island. I personally think I will never get bored of Bali — that smell of fragrant, burned incense and the harmony of Balinese gamelan cast their spells on me. Our introduction to Bali was Pemuteran and the northwest, so we eased into it. After that we went to Munnar which was what I think Ubud was 20 years ago. We didn’t like Ubud or Kuta, but at least at Kuta we knew what we were getting into. The culture is so cool. Temples in front of every house, offerings on the sidewalk, the dance, music, etc. I was not aware that there’s a place called Munnar in Bali — I always thought it’s exclusively reserved for a small town in Kerala, India. With Ubud, it’s either you love it or hate it, and my experience proves how picking the right season is crucial in determining how one’s stay in Ubud will turn out. As for Kuta, I have been avoiding Central Kuta altogether for as long as I can remember. The Indonesian central government is planning to build a second airport at the island’s north. That worries me since northern Bali has been largely spared by rampant development happening in the south — and I believe Pemuteran would be one of the first places affected by the airport construction, should it ever come into reality. hi Bama, the details in these Puras are so exquisite and so beautiful. I love every little details and I like how captured them. I’m surprised these puras are not overrun by tourists. Interesting insight on why they don’t make them as good anymore. I guess money from tourism always win over. It’s good for tourism workers but bad for the artisanship. 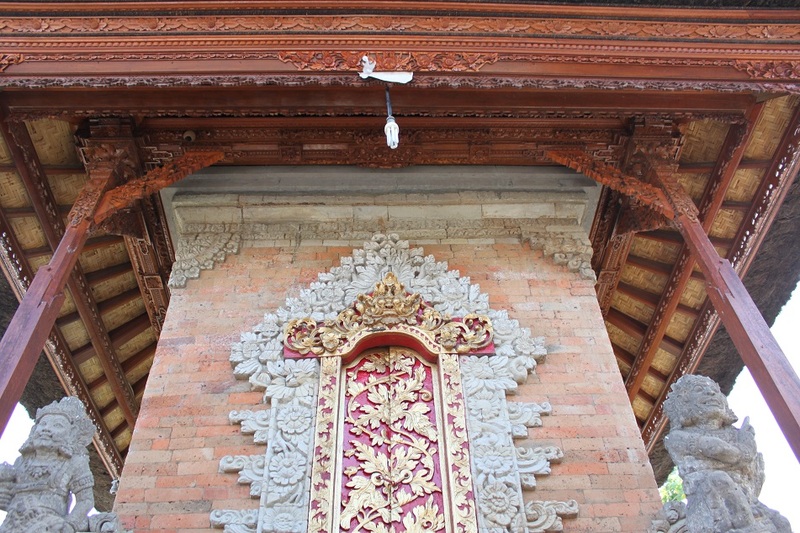 This pura’s location off the main road which connects some of Bali’s most famous sites helps hide this temple from the radar of most tourists. 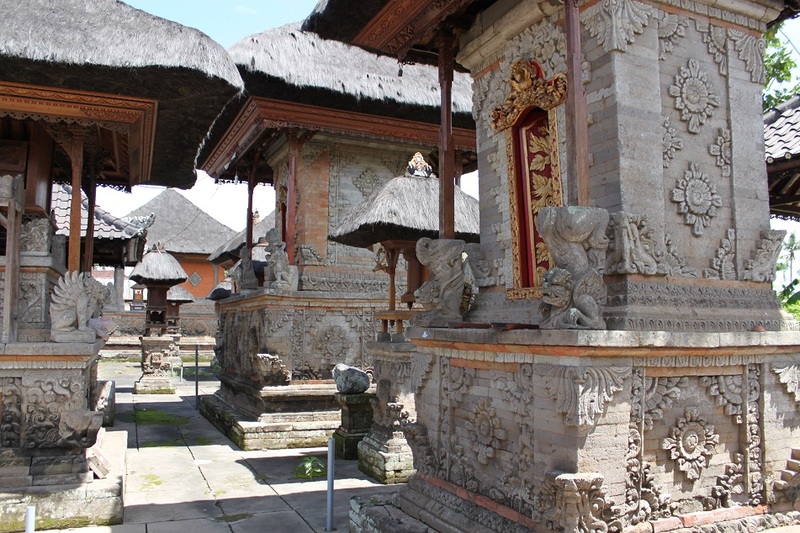 You have to be really interested in art, culture and Balinese temple to ask your driver to find this place since it’s not charted in any tourism maps. As for the money from tourism, it’s a little too late to reverse the trend, but what they can do is to keep Balinese culture very much alive among themselves and their children — something Balinese have been doing pretty well. Stunning carvings! You’ve captured the detail really well! I can’t resist taking photos of details. 🙂 Thanks! Indonesia is incredible. They reckon it takes 6 months to see everything. Looking forward to go back. Great pictures! I personally don’t think 6 months would be enough. In my rough calculation one would need at least 2 years. 🙂 Thanks again, Thuymi! 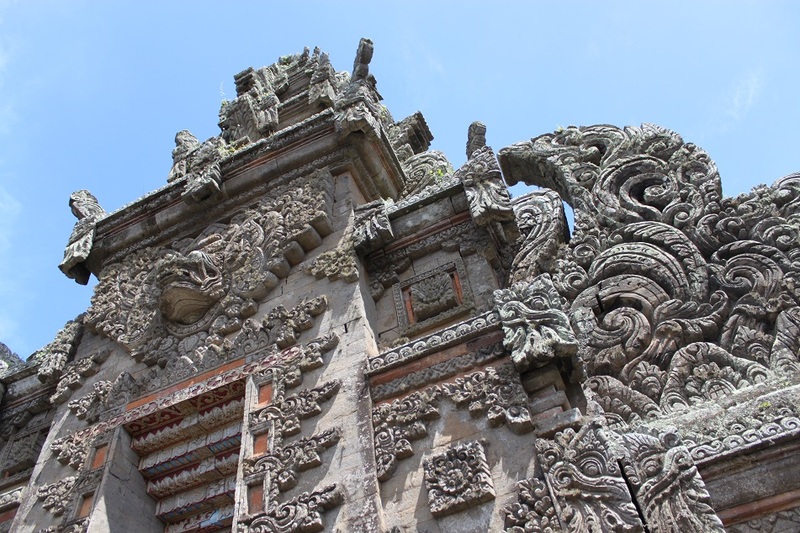 Pingback: Cirebon: A Cultural Melting Pot | What an Amazing World!